The West course is without doubt the jewel in the crown of La Manga Club. It is a beautiful course, well manicured and with marvellous scenery all around. It has an amazing variety of holes, each one presenting a different challenge; only the 11th and the 14th are what one might call ‘samey’. However, as my playing partners and I have come to realise, ‘the West course giveth, and the West course taketh away’. Whilst being an angel on the eye, it is a brute on the score. You really have to be on top of your game, manage the course well and have a bit of luck on the way as well, any bad shot is punished severely. Buy a Stroke Saver and five extra golf balls before you start. I could describe every hole to you, they all offer something very different, but I’ll just pick out a few real gems. By the way, each par three bar one has a Stroke Index of less than 10! I’ve not known that at many courses. The 3rd (par five) deserves a mention for its challenging tee shot, horrendous ravine and tucked away green. The 5th is a brute of a tee shot considering its SI, it really is quite a narrow target. The 6th is the first hole where you can get the driver out. The pearl of the front nine however, is the 9th, with an uphill tee shot (and I mean uphill) the hole then bends at right angles down hill to a huge green protected by a ravine to the front and lake at the back. It’s a real devil of a hole to ‘manage’. But it does present an eagle opportunity. If you feel a little punch drunk by the turn and deflated by something like just 12 points, beware the back nine, the holes just get better and better… and to some degree tougher. The 10th is a complete horror off the back tees, and then it’s up and down the mountains taking on the tough 12th and a horrid par three 13th that is as pleasing on the eye as it is punishing on the score card. The course concludes with probably the loveliest four consecutive holes I know. The 15th is a gorgeous par five with some well-placed trees along the centre of the fairway making shot selection an interesting task. The 16th is a brute of a par three with absolutely no room for error at all. There is only one place to put the ball, on the green, anywhere else is just a war zone. The 17th must have been a hole designed by five different people and then glued together. If ever there was a reason for buying a stroke saver then this is it. But nevertheless it’s lovely, and a joy to par. It is merely a prelude however, to everybody’s favourite La Manga Club moment. The 18th tee is a bit of a trek up a hill, and after a slog round the West course one could do without that, but the reward at the end is worth it. You are greeted with a tee at the top of a small mountain overlooking the 18th fairway and the landscape spreads out in front of you beyond the course and out across the La Manga Club complex, the countryside and then to the sea a few miles distant. It is a lovely view and an intimidating tee shot. It’s a place to get the big shiny driver out, tee it high and let rip. A 200-yard carry to a wide, wide fairway beckons. It is a great finishing hole to a great course. The West course is about a half mile from the main complex and it has its own clubhouse and bar. Without doubt the best of the three courses, but also without doubt the hardest. If you are an 18 plus handicapper don’t go near it unless you can happily exchange a low stableford points score for the sake of some lovely scenery. The La Manga Club complex presents three lovely courses which all have their own character and each offer a different challenge to suit all handicaps. The resort benefits from a well-run shuttle bus service and an attention to course care that always ensures the holes are in good condition. I would recommend La Manga Club to anybody who wanted an easy weekend of golf ‘on the doorstep’. It’s probably not the cheapest place to play, then again it’s not the dearest either, but the accommodation is reasonably priced and of high quality. The resort has a nice driving range and good putting and short game practice areas. The shop is well stocked, and a very pleasant man on a buggy is always whizzing around selling drinks and cheese and ham rolls to a lot of very thirsty golfers. I think it’s a great place. Played the 3 wonderfull courses at lamanga last week in october. Although all courses were very well kept and in great condition I found the West course to be a true delight to play, not that my scorecard said so but not only a very challenging and picturesque course but the type of course you could play everyday in the attempt to try and beat it ! Very tight with trouble everywhere but with some stunning views especially the tee box on the 18th hole which just took your breath away, if you ever get the chance to play the west course grab it with both hands and a bag full of balls !! Just had a 4 day trip to La Manga in early July. The courses were in amazing condition and the spectacularly beautiful West course topped the pile. Tee boxes and fairways were in pristine condition and the greens were as good as any i have played around the world including Valderrama ! Very tough course for high handicappers with tight driving holes and finely placed bunkers & barrancas but should not be missed at any price. We are already planning for next year, it was that good. Can't wait to repeat the experience. This was the first of the 3 courses we played during our stay in Mid July. I scored better on the West than any other - 39 points and might have done better had our buggy not broke down on the back nine forcing us to walk half the round in 90 degree heat.As other reviewers have said it is completely different to the other 2 courses - I have never hit as many 5 woods in 1 round and probably only pulled the driver 3 times - one of which resulted in a lost ball on the 9th.I agree the course makes you think, but unless you have played it quite a few times it is quite difficult to work out how far away the trouble is. Many holes are picturesque and if you were having a bad day off the tee you would have a few blobs on your card.Greens lovely, bunkers poor (pull the weeds out!). Very pleasant golf course but like all the LaManga courses very overpriced. We teed off at 3pm on a Sunday and saw no more than handful of groups on the course - more realistic pricing might attract a few more gofers. Definitely the best of the three courses at La Manga but also the toughest. You will be punished for bad tee shots and most of the green shots are either upwards or downwards. The eighteenth hole is one of the best, a middle long par four with a fantastic view over the La Manga complex and the bay further away. As we played the North course at La Manga the day before we tackled the West, we expected a similar challenge and standard of course. How wrong we were! This is a fantastic course, though very challenging as many fairways are narrow and the out of bounds is never far away. However, we found it a joy to play with so many beautiful holes winding through hilly terrain. Often holes are quite short, but generally are dog legs which make them particularly tricky. One of the favourites for me was the 17th hole, a short par five with water down the right side. What a surprise. A great golf course that has you thinking all the way round; there’s no automatic reaching for the driver here. This is not the longest course you’ll find, but it’s enjoyable to play a strategic course like this rather than the modern 7,000 yard slogs. Accuracy off the tee is essential, and the relatively small greens mean that you constantly have to think about where to land the ball. Too many favourite holes to mention. I would recommend this course to anyone. Grab the first tee time of the day (8am) and enjoy. The West course is completely different to the North and South. Gone are the views of the La Manga complex, villas and condominiums (except on the 18th tee) and in come the hills, barrancas and pine trees. For me, this is La Manga’s best course by far, simply due to the variation of holes and the more natural setting. Leave the big dog in the bag as the holes are as tight as a Yorkshire man and with tricky smallish greens this is perhaps the hardest of the three too (despite being some 500 metres shorter than the South). The West course is set a mile or so down the road from the main complex with its own clubhouse so factor that in when you book your tee time. I’ve never failed to be impressed with the lovely West course but take enough balls as the ravines have a nasty habit of swallowing them! As per the previous view, the tee shot on 18 really is that good… one of the most memorable in golf. 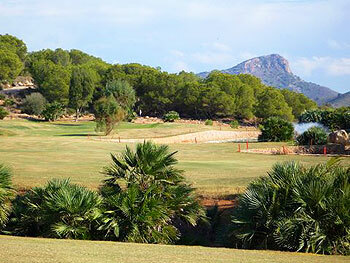 In my opinion the best course at La Manga – drama, great views and great holes. Be aware that this is very tough and I advise higher handicap golfers to think twice before playing. As early as the 2nd and 3rd holes, long carries are required and it may get a little soul destroying if not up to the test of the West. Up and down the mountains and set slightly away from the main La Manga complex, the West is on its own and stands out. Take a few minutes on the 18th tee to enjoy the view, prepare for the tee shot and remember how lucky you are to be there. Recommended.